Over the past year, I've really grown to love Love Me Beauty and their amazing monthly beauty boxes. 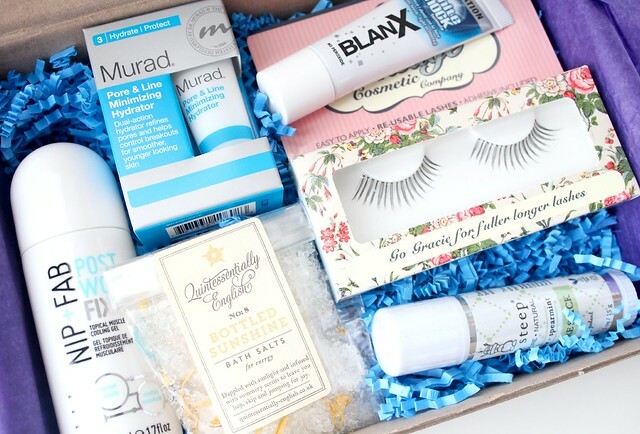 Every month I look forward to my box of beauty goodies arriving in the post and I'm never ever disappointed with the contents thanks to their 'menu' system whereby I can choose which box I'd like to receive. There's also the genius option of skipping a month if nothing takes your fancy, with no charge included. They've really covered all bases when it comes to customer satisfaction and I wouldn't think twice about recommending this box to anyone I know - it really is the best of the bunch. Its such great value for money too and their website states that every single box will be worth a minimum of £35, despite its cheap £10 price tag. I've actually known some months boxes to be worth around £60 so you're definitely getting your £10 worth with this box! 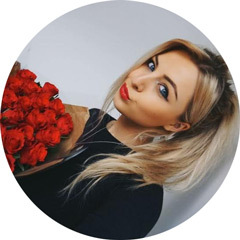 Even better, Love Me Beauty have very generously given me a 10% discount code, especially for my readers so if you're thinking about subscribing, be sure to enter 'CG10' in at the checkout to receive your discount! 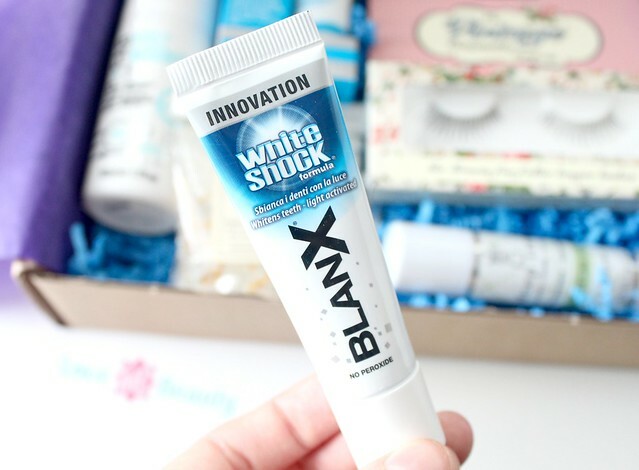 As I said at the start of this post, I wasn't actually meant to choose this box so and it was actually the Nip & Fab eye fix that I wanted to try but I'm still rather intrigued by this alternative, even if it isn't an essential. Now I'm not going to lie and say I work out all the time because I definitely don't but when I do, I seriously suffer with sore muscles. I went for a run a couple of weeks ago and for the next two days, I could barely move. Not ideal! I tried this topical cooling gel after a recent workout and I have to say, its bloomin lovely. The cooling and anti-inflammatory ingredients it contains really helped to relieve the pain but be warned, it tingles! 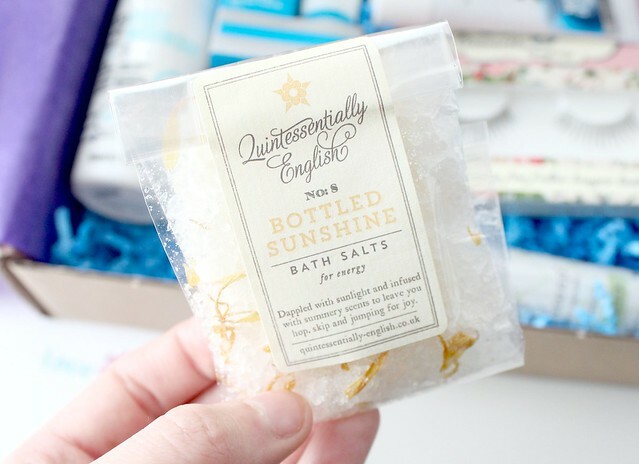 I'm really into bath products at the moment so I can't wait to use these 'Bottled Sunshine' (don't you just love this name) bath salts from Quintessentially English. I can already tell I'm going to love the scent - I'm obsessed with all things citrus - its so invigorating and energising! These bath salts are multi-purpose too - they can be used in the bath to fill the room with a beautiful aroma or mixed with a touch of oil and used as a scrub. Ahhh - relax! I've tried this toothpaste in the past and altought I wasn't wowed by the results, it did brighten my teeth ever so slightly. Not the most exciting product in the world and not a lot to say about this one - its minty and it cleans my teeth. That's all everyone looks for in a toothpaste, right? 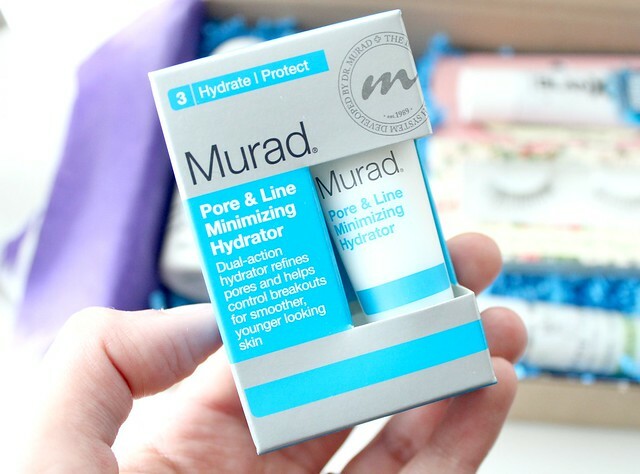 Murad is a high-end brand that I've tried in the past and really enjoyed. However, due to their sky high price tags, they definitely aren't the first brand that pops to my mind when buying new skincare. With this being said, its a real treat to get something to try from such a luxurious brand. This 'Pore & Line Minimizing Hydrator' sounds amazing too - it refines pores, helps breakouts and smoothes the skin. What more could I want? 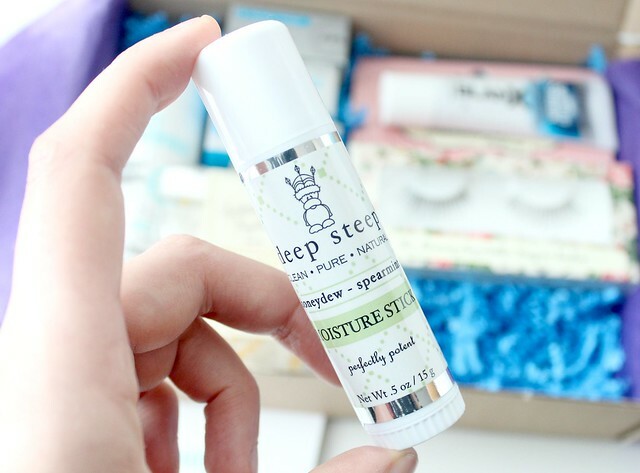 I've never heard of the brand Deep Steep before but I really love their packaging and this moisture stick is so handy. I've been using it regularly since receiving this box as it can be used for so many different purposes. Wherever you've got dry skin that needs a boost of moisutre, you can use this handy stick to apply it. Its less messy than a conventional moisturising cream or gel so its handy for travelling or popping in my handbag and it packs a decent hydrating punch! The Honeydew & Spearmint scent is divine too! I've actually tried lashes from The Vintage Cosmetic Company before and they're definitely one of my favourite false lash brands. I wore them none stop over Christmas as they're so easy to apply, lightweight and very natural looking. I've been meaning to repurchase some ever since so I was chuffed to bits to see these 'Gracie' lashes, which are actually my favourite style, featured in this months box. I find these perfect for adding volume to my lashes whilst still looking really natural. I've totally gone off that whole big lashes look lately and I'd much rather wear something like this which enhances what I have naturally without looking trashy and fake! Once again, another amazing box from Love Me Beauty! I'm still kind of gutted I chose the wrong menu but that'll teach me not to read things properly! 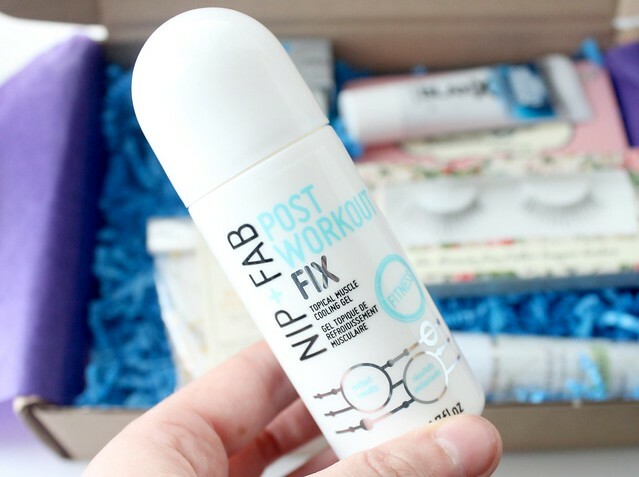 The contents of this months box come to well over its £10 price tag (the Nip & Fab/Murad products alone come to almost £20) so yet again, its amazing value for money! 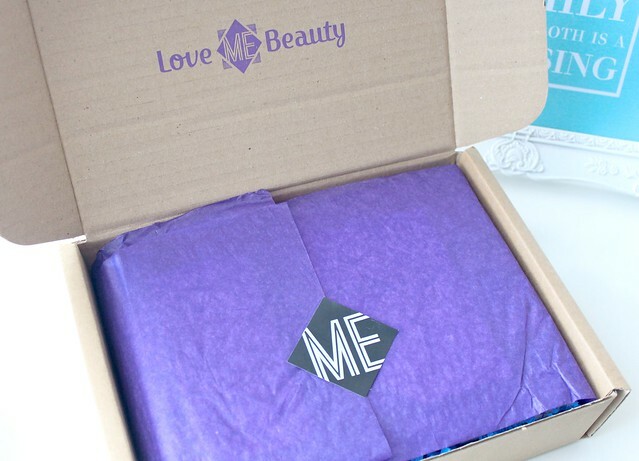 If you fancy trying these products for yourself and receiving a box of beauty treats in the post each month, be sure to sign up to Love Me Beauty using my discount code 'CG10' (expires 04/04/14). Its too much of a bargain to be missed! Are you signed up to Love Me Beauty? Which product would you most like to try from this months offerings? Really cute parcel. I love the packaging. Nice products. Wow you got some great items! I'm not signed up for Love Me Beauty but I'm sorely tempted to. All of the beauty products look wonderful and I could use all of them. I wouldn't mind the tingling of the Nip & Fab Topical Muscle Cooloing Gel in place of my soreness. My skin could surely use the Murad Pore & Line Minimizing Hydrator and the Vintage Cosmetic Company 'Gracie' Lashes look lovely. The prices look very reasonable. 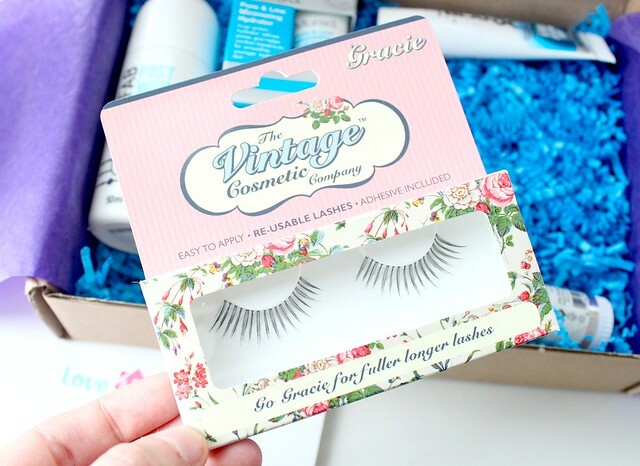 The Vintage Eyelashes look perfect for that natural look and the packing is so adorable! 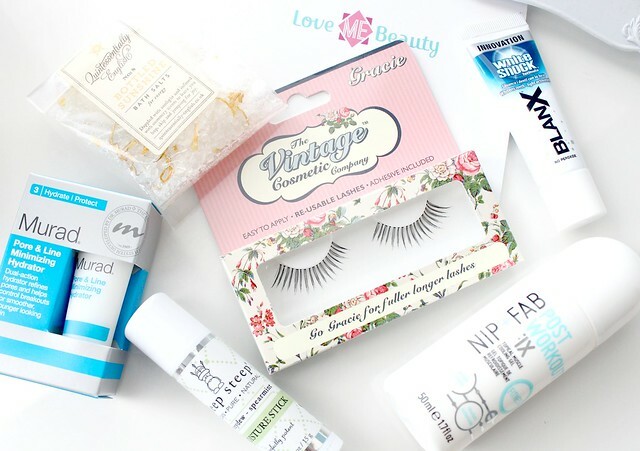 There are so many beauty boxes out there nowadays. I just can't keep up! Love the sound of this beauty box and its great that you get to chose which box you get. Theres nothing worse than paying the subscriptions and revive a box with nothing in it you like. Ohhh! I love the packaging of the lashes. Also, that box seems very promising, unlike a lot of other subscription box services I've received in the past. Those eyelashes look so pretty!